The Custard Point "retro fish" is a very high volume small wave board. Big flotation, early wave catching and amazing manouverability make this board one of our most popular over the last few years. Available in sizes 6'0", 6'2", 6'4", 6'6", 6'8", 6'10", 7'0", 7'2", 7'4"
The bottom shape is flat into tail v , with a chine on the rail, allowing this board to smoothly go from rail to rail without snagging. The flatter deck allows us to maximise rail volume for stability and wavecatching. They come set up with quad fins. FCS on the polyester versions and Future fin system on the Epoxy versions. We produce these boards in both epoxy and polyester resin. Colours 5 and 6 are made with epoxy resin and styrofoam core and are fitted with the future fin system. 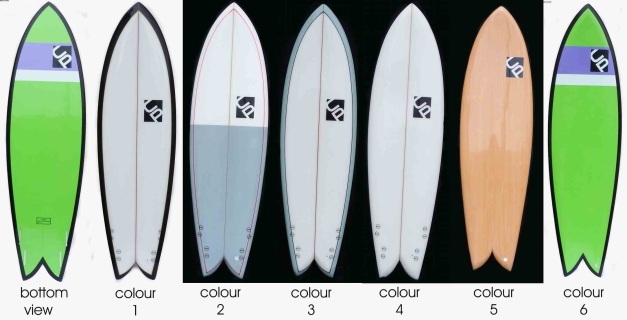 Colours 1,2,3 and 4 are made with polyester resin and polyurethane foam (the traditional way and come fitted with the FCS fin system.